Between 8 December 2011 and 8 January 2012 the Institute of Heritage Conservation and Restoration (formerly Makerere Art Gallery; the Institute hereinafter) hosted the ‘100 Posters for the Right to Education Exhibition’ (100 Posters Exhibition hereinafter) to celebrate the International Human Rights Day. 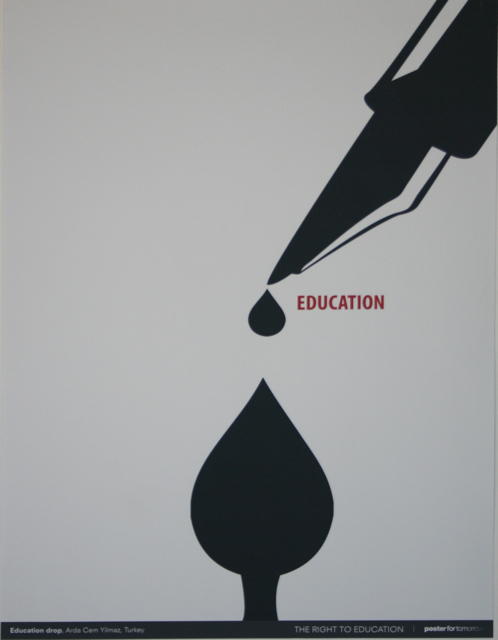 In this essay I analyse a selection of posters to expose the visual and legal issues behind the right to education in Uganda and the point at which the exhibition intersected with this right. I observe and argue that the right to education is a legal right whose enforcement is in the province of the judiciary. It is not absolute. However by insisting that it is an absolute right to be enjoyed without exceptions, the exhibition succeeded in inviting artists, designers and human rights lawyers to join hands and fight together to protect fundamental rights and freedoms. 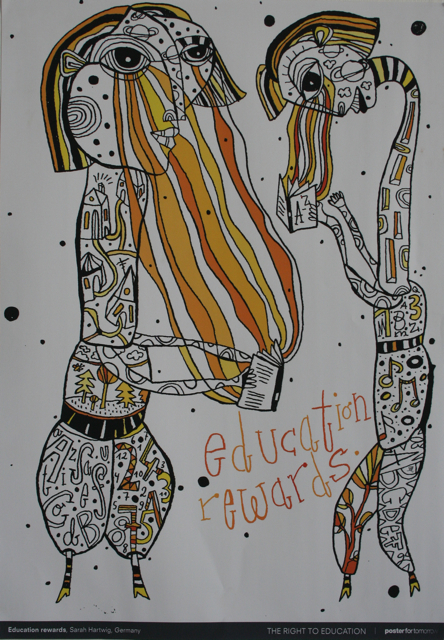 The 100 Posters for the Right to Education Exhibition: its nexus with rights? 100 Posters Exhibition was a joint effort between Poster for Tomorrow, a non-profit organisation based in Paris (France), and the Institute. Its theme was the right to education. The Human Rights and Peace Centre (HURIPEC) was invited to participate. Consequently the exhibition was officially opened by Dr. Mayambala Kakungulu from HURIPEC at the Faculty of Law. All the posters are now part of the Institute’s permanent collection. Now, the Institute has a rich collection dating back to the days of Margaret Trowell the founder of Margaret Trowell School of Industrial and Fine Art (MTSIFA). Some of the works collected comment on issues concerning education in Uganda. They are few compared to other thematic areas. They however demonstrate the position artists have taken towards the right to education in Uganda. For example during the late-eighties Sennoga Freddie did his ‘Okusoma’ (Literacy; 1987). 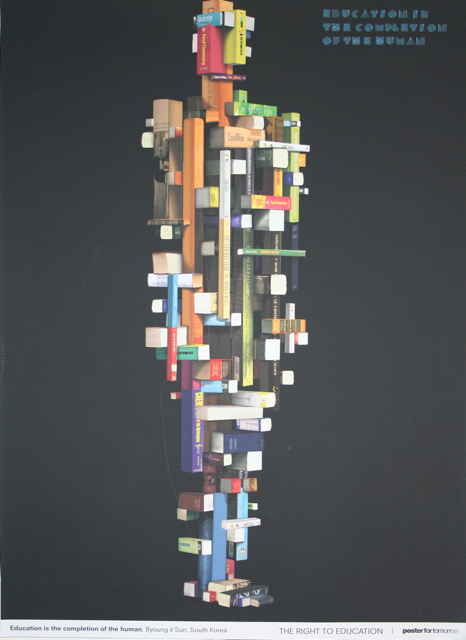 With complicated numbers and abbreviated words challenging a human subject forcing his eyes to pop out, the painting is an ominous comment on the country’s low levels of literacy and numeracy during the late-eighties. 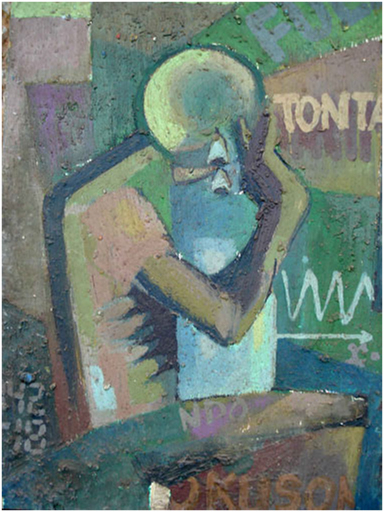 Sennoga explored related tropes in his ‘Untitled’ (The news reader; 1987). Here he captured an anonymous male subject dominating a space. He used light, and a female figure entering the picture plane, to introduce life in a largely lifeless space characterized by leaf-less trees and a misty grey landscape. The painter may have chosen to alter normative conventions and expectations inviting us to see a world in which a human subject can redefine his access to information. Put in this light the man before us can be seen as one who has deliberately chosen to read the newspaper upside down. However, by depicting a man wearing no shirt and shoes, the artist persuades us to place the man before us into his poor, uneducated (and not our own educated, elite) class. 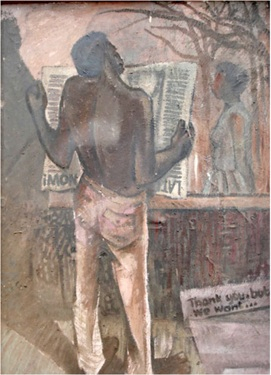 Translated literally the painting seems to suggest that the man before us is illiterate; he just does not know the right way to read a newspaper. The painting elicits a deep understanding of modernist styles; it confirms the artist’s access to western visual vocabulary, materials and aesthetics through formal art education. It does not portray the injustice associated with the lack of access to education; it captures a kind of human folly inviting laughter. Thus, by relying on humour, ambiguity and multiplicity of meaning Sennoga’s painting defies being fixed to a single reading as it gains its position on the trajectory of contemporary Ugandan art. Like Sennoga’s paintings many of the posters in the 100 posters exhibition demonstrate a deep understanding of the canons of aesthetics: management of space, balance, harmony and mastery of media. Emil Dodov’s handling of geometric shapes and control of chalk coupled with the balancing of colour in ‘Jump! Its your right’ can be cited as exemplary. Secondly, like Sennoga’s works some of the designers relied on unconventional symbols to force the beholder to think about inner meaning. This is especially so in the posters with messages encrypted in non-scholastic objects. 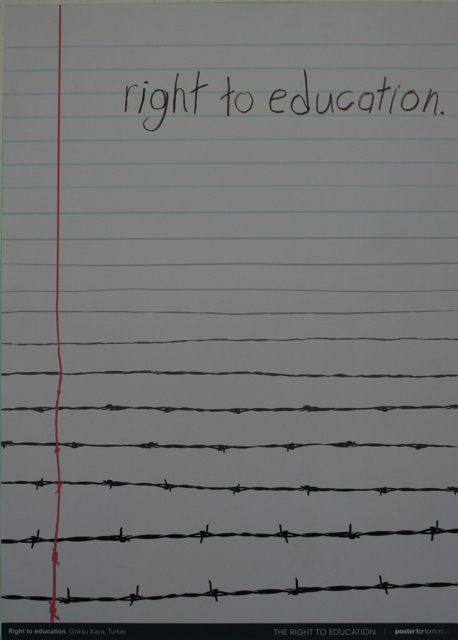 For instance the meaning in Göksu Kaya’s ‘Right to education’ in which the designer combined paper and barbed wires to critique the barriers to education is probably not on the surface. 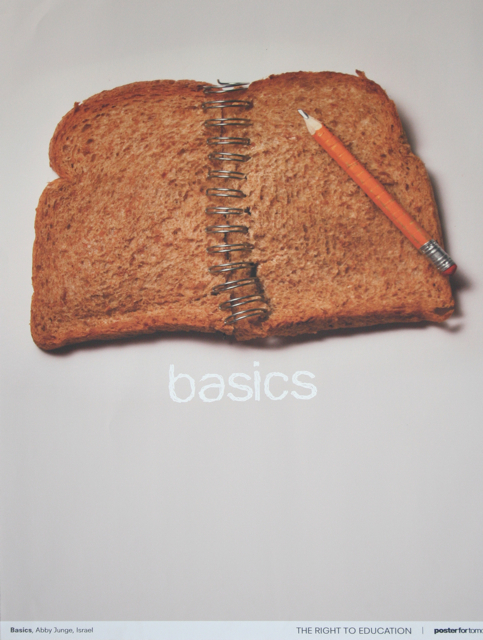 I did not find it easy to access the coded message in the poster titled ‘Basics’ in which Abby Junge depicts a pencil placed on top of a spiral-bound slice of toasted bread. I must confess nevertheless that these challenges forced me to stop and think carefully and in the process dialogue with the posters rather than casually passing by. The posters became objects of contemplation just like any other artwork in the Institute’s collection. 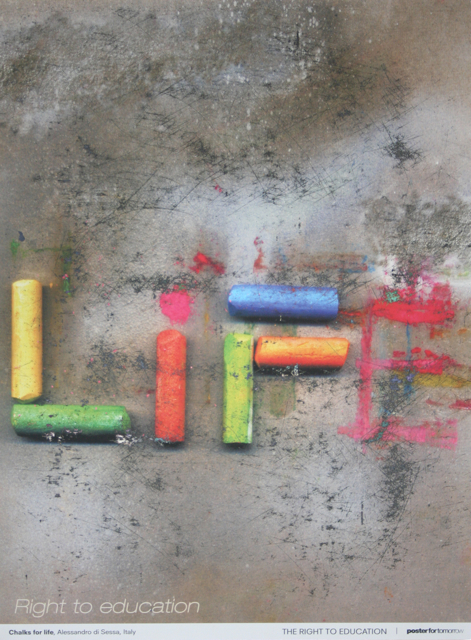 We see chalk in Alessandro di Sessa’s ‘Chalks for life’. This is not to suggest that designers used these objects without thought and innovation. 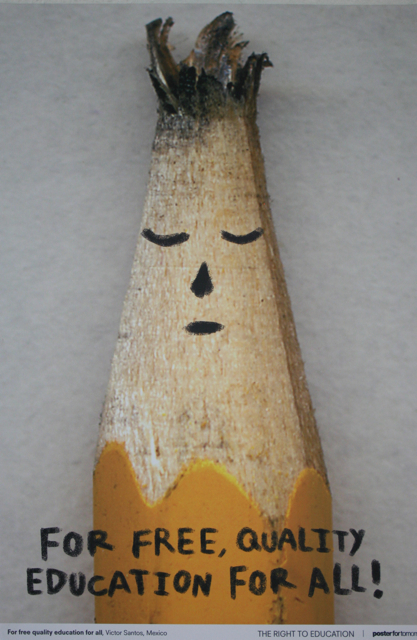 For example Ulises Ortiz’s use of an anthropomorphic pencil in his ‘Education is freedom’ was thoughtful, creative and innovative. I am however interested in the preference for such symbols. 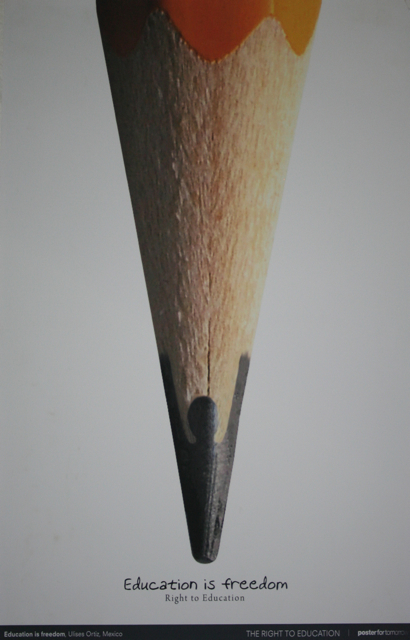 Even none conventional symbols were transformed into pens/pencils as we see in Luca Sorbini’s ‘Weapon’ where a catapult has been transformed into a pen. Arguably then, like Sennoga’s paintings many of the posters are grounded in conventions of western education. They do not look beyond numeracy and literacy to admit other forms of knowledge transfer and acquisition. I thus argue that like Sennoga’s paintings the posters are elitist. They are captioned in elite symbols and languages (mainly English) and are housed in an elite space (the gallery). This limits their access to the few privileged elites who visit galleries and have attained the necessary language skills and education to access their codes and vocabulary. In this context the exhibition is completely inaccessible to the majority of Ugandans. This then suggests that the exhibition did not represent or seek to speak to the most vulnerable Ugandans. It simply proclaims that the right to education is universal and must be given to everybody including every Ugandan. If Sennoga relied on the adult we notice that most designers for the 100 posters exhibition relied on the symbolism of a child to make their point. Premised on this platform education becomes a basic norm necessary for survival. Yet in both instances the chosen symbols are problematic in the sense that they do not have universal representation. They however complement each other. In addition, the exhibition enriches the Institute’s collection with other neutral symbols. 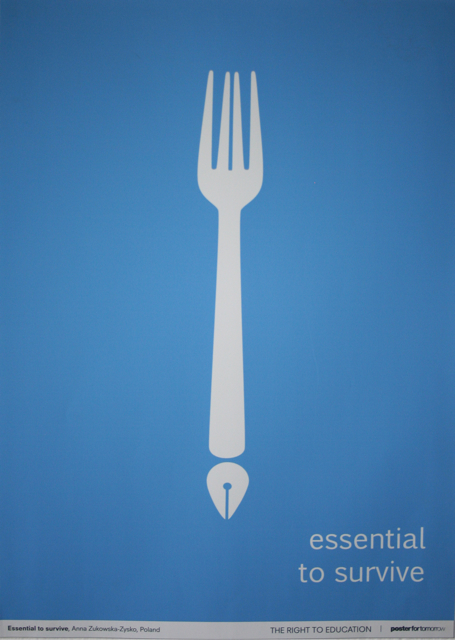 For instance in her ‘Essential to survive’ Anna Zokowska-Zysko does not use a human symbol; she connects education to human survival using a folk turned into a writing pen. Also, unlike Sennoga’s work, the posters in the 100 posters exhibition have very limited ambiguity. They show simplicity of design. 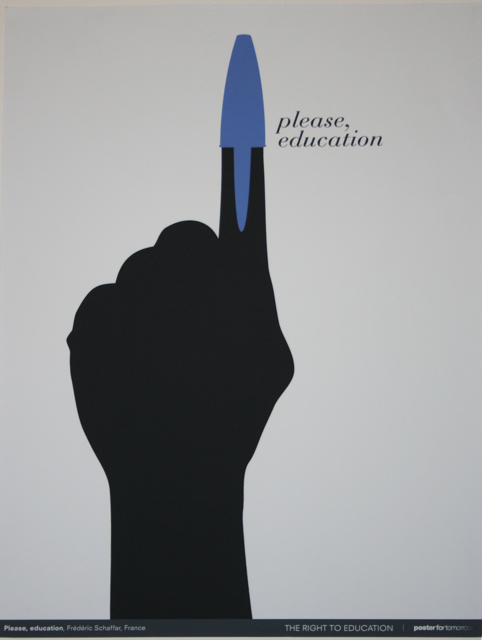 Frédéric Schaffar’s ‘Please, education’ has a black silhouette of a hand with an erect index finger capped with a blue pen cover; Louise Héroux used a simple, empty classroom in her ‘Je veux/I want’. Other posters are bathed in a wealth of detail but still they bear clear messages. Carlos Logroño’s ‘Clean’ can be cited here. 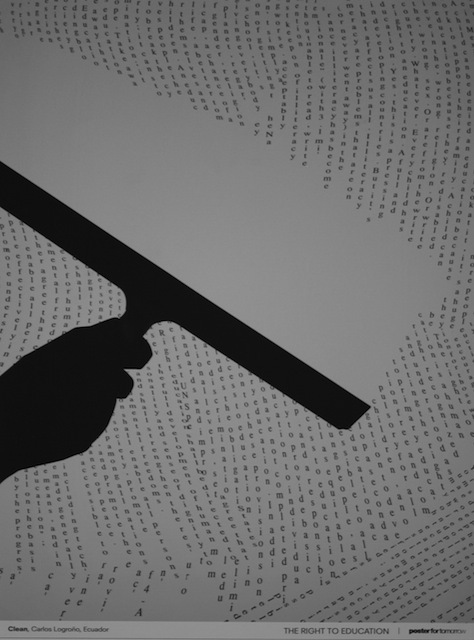 The designer depicts a hand firmly pulling a squeegee against a slate covered with detailed information. He maintains a delicate balance between open and occupied space (small and large details) while presenting the possible list of benefits which may be lost if (and when) the right to education was denied. To further enhance the delivery of their message the designers relied on captions. Written captions at the bottom of (and within) the posters tend to prescribe and guide their communicative power in varied ways although the deployment of objects which are not necessarily scholastic permits meaning to multiply almost endlessly. 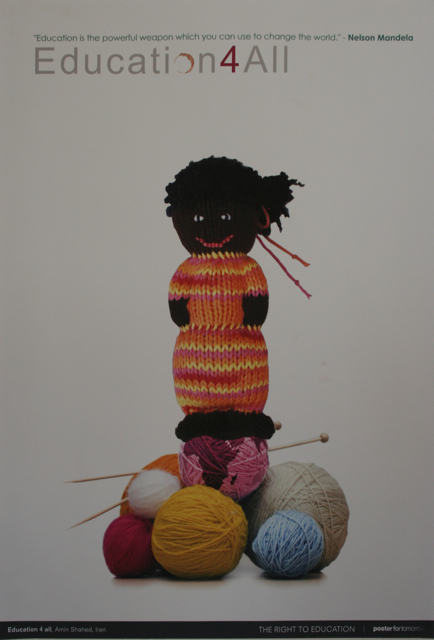 For example Amin Shahed used a doll and balls of threads in his ‘Education for all’. The doll is art, a product of human innovation and creativity. But then the presence of the doll together with the tools and materials used in its making invites an inquiry into art/design as a product and process. 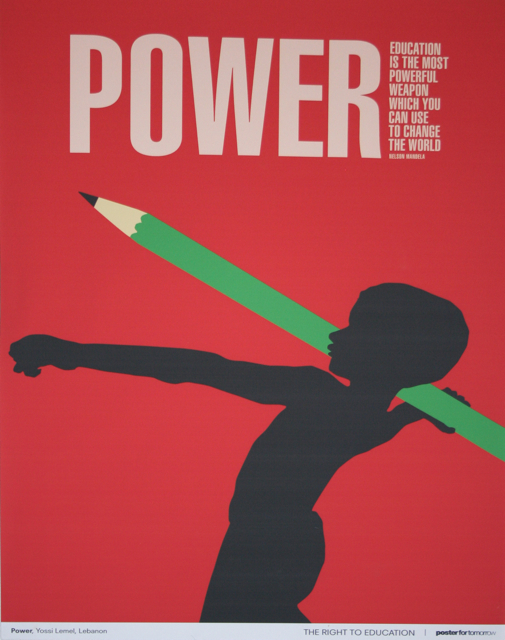 All these things (if indeed they are things) can neither be directed nor confined by the two captions at the top of the poster, namely: (i) ‘education is the powerful weapon which you can use to change the world’ and (ii) ‘Education 4 all’. And who gives the right to education? Oleksandr Parkhomovsky used his ‘Education is vital’ to circulate the view that parents decide which education is best for their children; Carlos Logroño in his Clean places the obligation on the shoulders of nations, the States. The correct legal position is that both the parents and the State are responsible. Article 30 of the 1995 Constitution of Uganda (the Constitution hereinafter) grants the right to education; Articles 31(4) provides that it is the right and duty of parents of care for and bring up their children. Article 34 (2) provides that a child is entitled to basic education which shall be the responsibility of the State and the parents of the child. Article 18 (2) of the African Charter on Human and People’s Rights (the Banjul Charter hereinafter), among other international treaties and conventions, place this obligation on the State. Consistent with these provisions of the law, but also as a matter of traditional family obligations, parents in Uganda provide for the education of their children. The government of Uganda has rolled out the Universal Primary education (UPE) and the Universal Secondary Education (USE); it invests a lot of money in tertiary and vocational education. International donors and agencies also fund education in Uganda. Does the quality of education matter? Kristy Birtwistle used the metaphor of house-construction to suggest that the quality of education matters. She seems to contend that the material one uses to build determines the quality of his/her house. In her ‘The strongest future’ she presents houses having varied degrees of strength derived from different materials and material strengths. It is inferable from her poster that straw is the weakest and most unreliable building material. It represents the poor quality of education provided at the preschool level. Tree branches are stronger than straw but unsatisfactory and untidy. Tree branches represent the education provided at the primary school level. Bricks are the strongest and most satisfactory building materials. They represent the much better education offered at the secondary and other tertiary institutions. Birtwistle asserts that it is improper to give children poor quality education at preschool education and expect to strengthen the curriculum as children go through primary to secondary schools. Children at all levels must be given the best education in order to ‘give every child the strongest future’. I agree with this position. First, as we see in Victor Santos’s ‘For free quality education for all’, universal education must not only be free, it must be quality education as well. Thus Birtwistle’s critique allows us to understand why critiques raise serious doubts about Uganda’s UPE and USE. By demanding improvements in the quality of UPE and USE critiques argue that under UPE and USE schools admit and train school-goers; they churn out job-seekers. Two, good quality education gives intellectual freedom and freedom from violence. 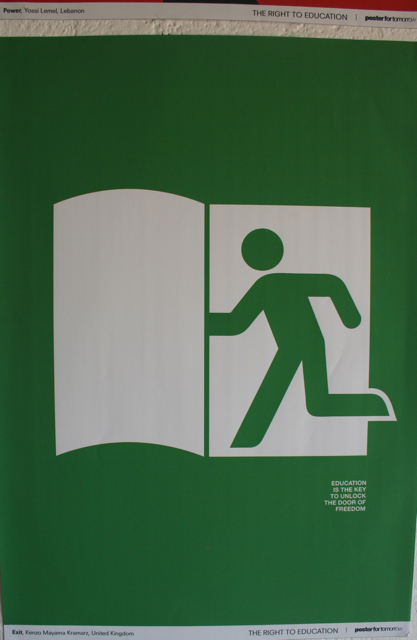 Kenzo Mayama Kramartz presents a subject uninhibitedly running across an open book in his ‘Exit’. Through the symbolism of uninhibited access to a book, and thus knowledge, Kramartz depicts intellectual freedom based on the notion that education is ‘the key to unlock the door of freedom’. 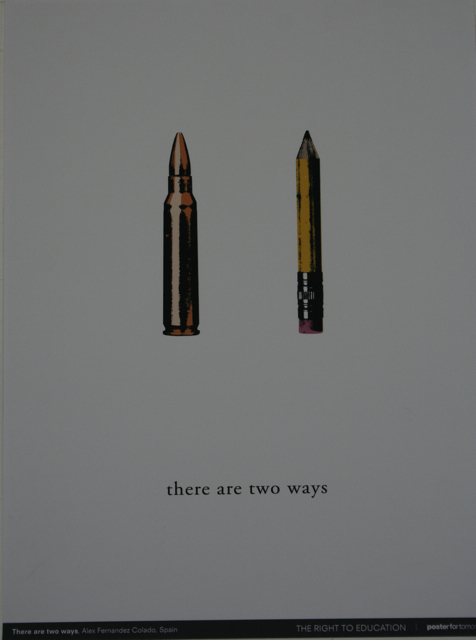 In his poster titled ‘There are two ways’ Alex Fernandez Colado depicts a bullet and a pencil giving them equal weight and presence in the middle of the poster. He seems to make the point that society can choose between granting education and reaping a violence. 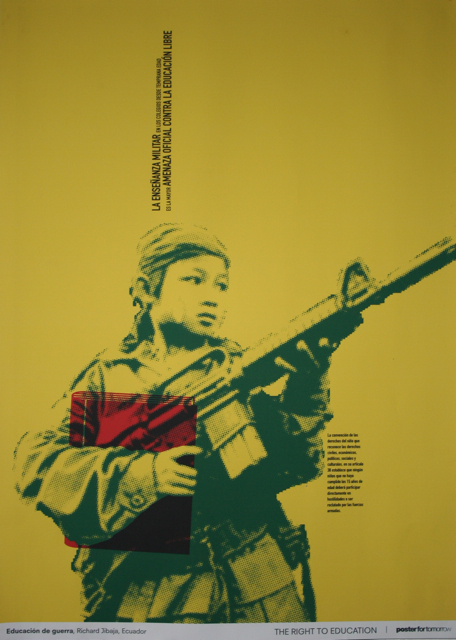 In essence by denying the right to education society will reap the kind violence seen in Richard Jibaja’s ‘Educación de Guerra’ a poster in which an armed functionary wields a high-caliber weapon ready to shoot and take away people’s rights, lives and freedoms. Critiques also argue that the best schools in Uganda do not provide to learners a ladder to greater heights of knowledge. (Such a ladder is emphasized in Chiara Ridera’s poster titled ‘Achieving goals’.) They do not train students to acquire the kind of self-actualization envisaged by Sarah Hartwig in her ‘Education rewards’. Rather, they train crammers fluent in foreign languages and having a high appetite for ostentatious consumption and western values. I admit that this criticism concentrates on weakness. Critiques miss the ways in which educators like Margaret Trowell, the midwife of formal art education in Uganda, resisted western cultural imperialism and ‘invented’ a new form of art education which respects African values. I however concede that Uganda’s formal education has bred a class of privileged members of society. (And I am a member of that club). This club constitutes the privileged class Carlos Perez addressed himself to in his poster titled ‘You are so lucky you can read this’. It speaks foreign languages; it has high appetite for ostentatious consumption and western values. 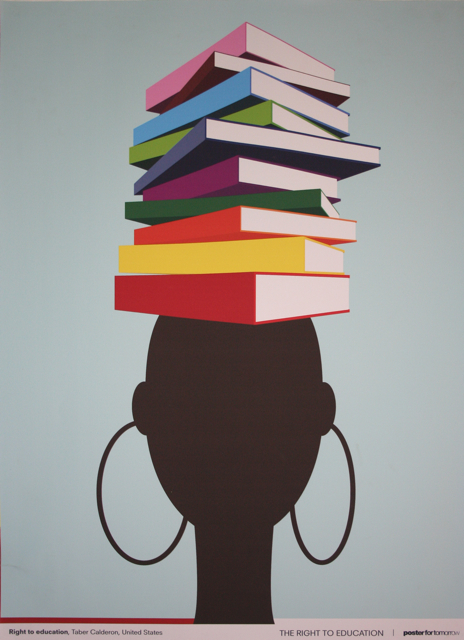 Put simply, the 100 posters exhibition provokes a debate on the quality of Uganda’s education: what it is, what it is not and what it should be. This debate is made possible not because the designers specifically had Uganda’s challenges in mind. They came from different parts of the world and from all continents; they therefore were unaware of Uganda’s specific challenges. However this debate is made possible because the designers identified the right to education as an inherent and universal right to which Ugandans are entitled. This nexus is fundamental. It explains the posters’ relevance to Uganda’s specific challenges. Okay, the right to education is thus inherent and universal. But is it also absolute? 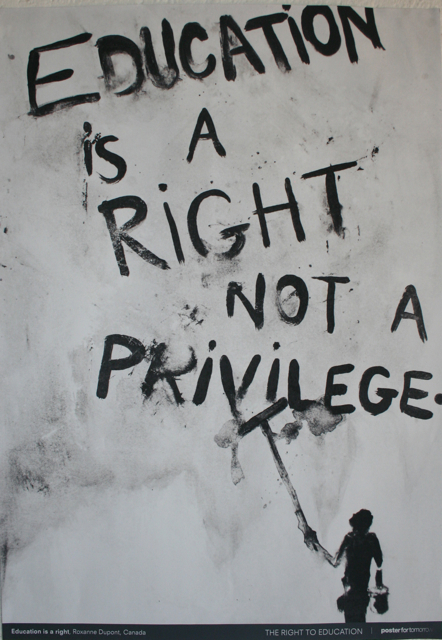 Roxanne Dupont in her ‘Education is a right’ asserts that ‘education is a right not a privilege’. Taber Calderon insists that women are entitled to education in his ‘Right to education’. 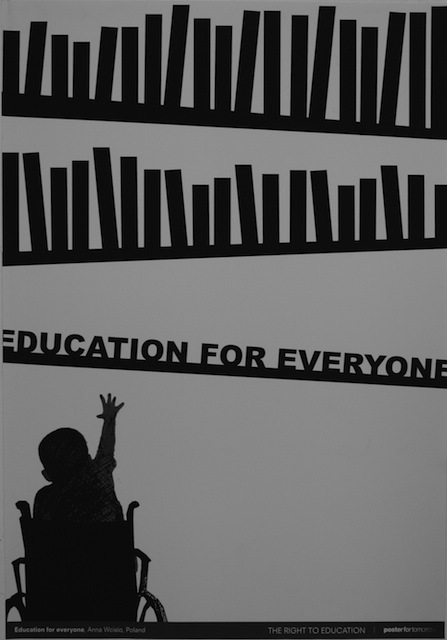 Anna Wcislo, in his ‘Education for everyone’, and Alice Drueding, in her ‘Education for all’, advocate that education be given to all without discrimination against people with disabilities. Expressed in these terms, the right to education becomes an absolute right for all. However this is not always the case. 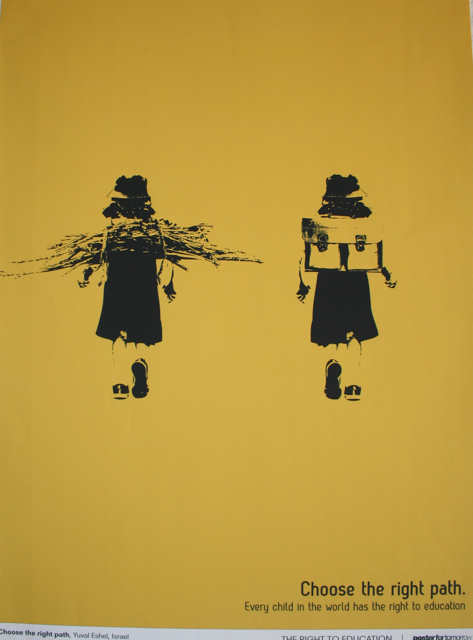 Yuval Eshel did a poster in which two children walk towards an undefined destiny. The emptiness of the space surrounding them allows us to focus our attention on the different choices being made for two girls of equal age. One is made to carry firewood (an ominous representation of domestic chores); the other carries a school bag (a symbol for education). 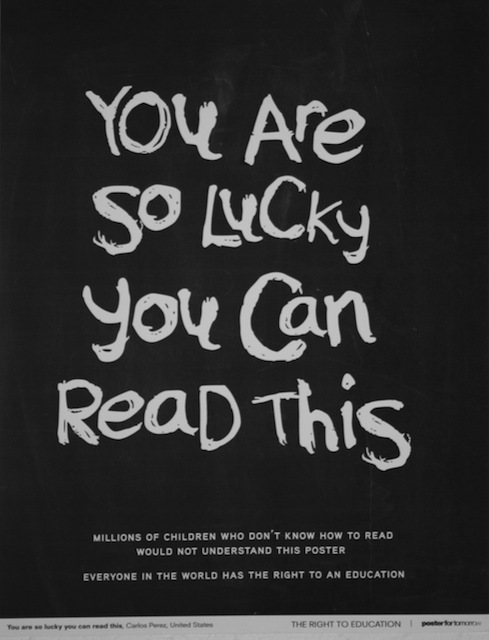 This poster is cast in a universal concern that ‘every child in the world [must have] a right to education’. Granting children education puts them on a right path. Thus the designer is concerned that this right path is often denied under a form of discrimination in which some girls are removed from school to do domestic chores. This is common in Uganda. 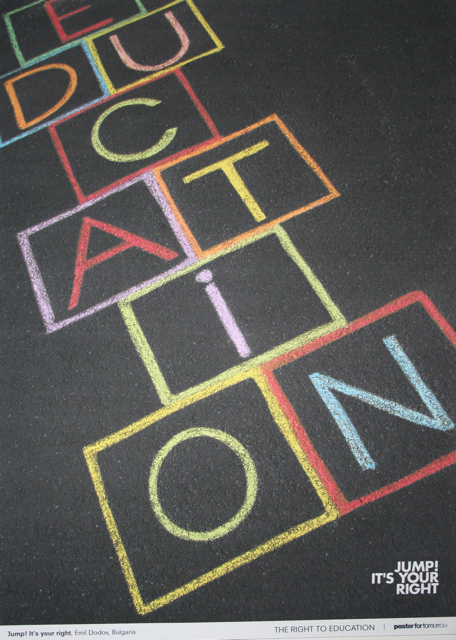 But, Eshel has a message to us all and it is this: ‘choose the right path’ of giving education to all children. Put simply, the exhibition defined education as an absolute right which must be enjoyed by all – and in Charles Bignon’s ‘Hands up’ this case is made using the symbolism of hands of all ages surging towards the right to education. This is a valid position; the way the poster designers have approached it is visually appropriate. 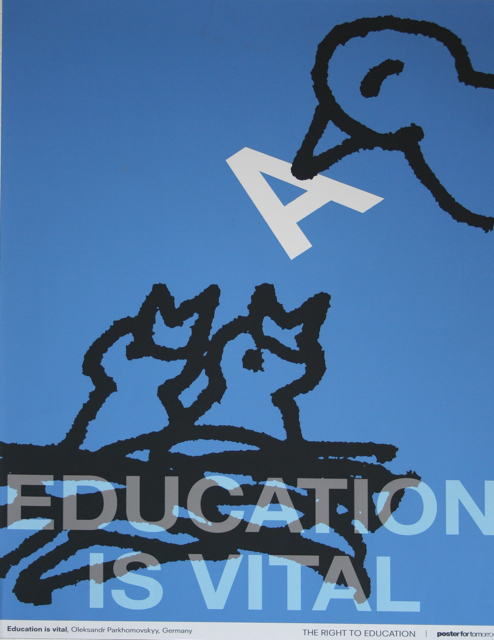 But is the right to education as absolute as the posters in the 100 posters exhibition seem to suggest? This is a legal question inviting a legal answer. Article 30 of the Constitution provides for the right to education. 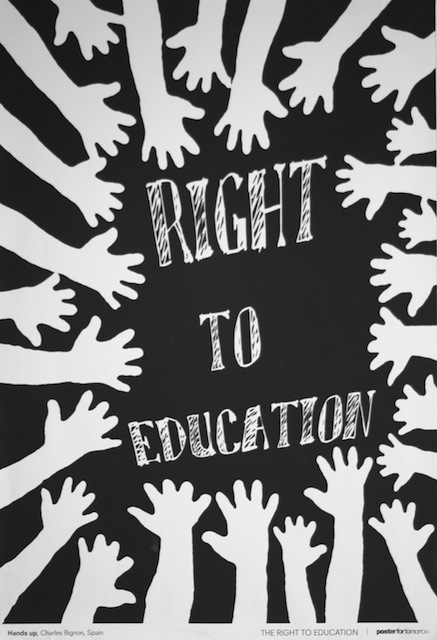 It states that all persons have a right to education. This right is fundamental and inherent. It has to be respected by all organs of the Sate and all persons according to Article 20 of the Constitution. However in the eyes of the law this right is not absolute. It is subject to the general limitations provided under Article 43 of the Constitution. Its enjoyment cannot prejudice the fundamental rights and freedoms of others or the public interest. These issues lay at the heart of the case of Dimanche Sharon and Others v Makerere University(1). In that case the Supreme Court of Uganda considered a petition challenging the constitutionality of Makerere University’s policy and regulations which required students belonging to the Seventh Day Adventist Church to attend scheduled lectures and sit tests and examinations on Saturday contrary to their fundamental beliefs. One of the issues for court to decide was whether the impugned policy and regulations contravened the appellants’ right to education as guaranteed by Article 30 of the Constitution. The Constitutional Court had answered this issue in the negative hence the appeal before the Supreme Court. The Supreme Court upheld the decision of the Constitutional Court and dismissed the appeal. Odoki CJ found and held that by giving them a second chance to sit for the exam which they had missed because it was done on their Sabbath, Makerere University had discharged its duty to accommodate the appellants’ special concerns. It had mitigated the adverse effect of its policy and regulations on the appellants’ right to education. In the premises granting the demands of the appellants would be unreasonable and would ‘cause undue hardship and expense to the respondent [University] as well as seriously affect the ability of the respondent to provide accessible, affordable , quality higher education to a diverse and multi-religious community’ (par Odoki CJ at page 34). Thus the Dimanche Sharon case is to the effect that where a reasonable decision to deny the right to education is taken against an individual, Courts in Uganda will not interfere with such a decision to avoid placing undue pressure onto educational institutions. Although based on the principle of reasonableness this decision is not good. Clearly the Supreme Court was alive to the settled principle in the case of R v. Big M. Drug Mart Ltd(2) which is to the effect that a broad and liberal spirit is required whenever interpreting a constitutional provision concerning the rights of an individual. It is therefore ‘essential that a Constitution is not interpreted in a narrow and legalistic way but generously, and purposively, so as to give effect to its spirit, and this is particularly true of those provisions which are concerned with the protection of constitutional rights’ (par Odoki CJ at page 15; my emphasis). And yet Court did exactly the opposite. The Supreme Court narrowed the whole debate to what Katureebe JSC called ‘public interest’ and rejected the petition. In a country where people rarely participate in the making of decisions which affect their lives because of what human rights lawyer Dr. Christopher Mbazira (2011:18) calls a ‘democracy deficit’, public interest is often a reflection of the whims of the President; reasonable programmes may be unreasonably implemented. In my opinion, therefore, reliance on public interest and reasonableness, per se, may erode people’s rights in general and right to education in particular. Unfortunately, the complainants had no further appeal since Art 129(1)(a) of the Constitution creates the Supreme Court as the highest Court in Uganda. Parliament cannot help either; it has to avoid being seen to favour a particular religion in breach of Article 7 of the Constitution which protects the secularity of the state. Arguably then the petitioners in the Dimanche Sharon case exhausted all local options without getting any meaningful remedy. [O]ne purpose of the exhaustion of local remedies requirement is to give the domestic courts an opportunity to decide upon cases before they are brought to an international forum, thus avoiding contradictory judgements of law at the national and international levels. Where a right is not well provided for in domestic law such that no case is likely to be heard, potential conflict does not arise. Similarly, if the right is not well provided for, there cannot be effective remedies, or any remedies at all. I submit that this is good law. However, the grounds on which the African Commission can offer remedies to a party whose claim is admissible under Article 56(5) are still small and interlaced with policy considerations. This is an unfortunate reality which explains why very few cases have been decided by the African Commission. The few decisions taken so far merit some analysis because they highlight the situations in which the continental Court may intervene to help those whose right to education is threatened. For example on 25 July 1996 Major Pierre Buyoya launched a coup and overthrew a democratically elected government headed by Sylvestre Ntibantunganya. Consequently, Ethiopia, Kenya, Tanzania, Uganda, Rwanda, Zaire (now the Democratic Republic of Congo) and Zambia held a summit at Arusha on 31 July 1996 in which they declared an embargo against Burundi. Supported by the United Nations and the Organisation of African Unity, the embargo was intended to force the coup leaders to enter into negotiations with other political groups in Burundi with a view of re-establishing peace and stability in the country. And yet the embargo affected the delivery of essential services forcing the respondent countries to change the sanctions regime in order to allow the delivery of essential goods and services. The petitioners in Association pour la sauvegarde de la paix au Burundi v Tanzania, Kenya, Uganda, Rwanda, Zaire and Zambia(4) challenged the embargo contending that as long as it prevented the importation of scholastic materials into Burundi, it had violated the right of Burundians to education and contravened Article 17 (1) of the Banjul Charter to which the defendants (apart from Ethiopia which ratified it later) were signatories at the time. The African Commission argued that in matters like these it will investigate if the embargo complained of is “excessive, disproportionate… indiscriminate and seeks to achieve ends beyond the legitimate purpose”. It will also inquire where the embargo goes beyond targeting the main perpetrators of the nuisance complained of and begins to interrupt the delivery of basic needs to a vulnerable population. Using these principles and tests the African Commission found and held that the sanctions complained of had targeted the perpetrators and had not disrupted the delivery of essential commodities which were exempt from the embargo. The embargo was thus not indiscriminate and unjustified. This decision underscores the contention that the African Commission will help in situations where the denial of the right to education is indiscriminate, unjustified and unreasonable. As such, in Zaire (now the Democratic Republic of Congo or the DRC) where the denial was indiscriminate, unjustified and unreasonable, the African Commission interfered. In the case of World Organisation Against Torture, Lawyers’ Committee for Human Rights, Jehovah Witnesses, Inter-African Union for Human Rights v Zaire(5)the military had unreasonably and without justification targeted and closed universities and secondary schools, belonging to the Jehovah’s Witnesses (Témoins de Jéhovah) for two years. This was part of a sustained brutal campaign against the religious sect. The African Commission found and held that the closure of the sect’s universities and secondary schools constituted a violation of the right to education. Similarly, in August 1998 Uganda, Rwanda and Burundi invaded the DRC, occupied its territory, indiscriminately transferred the civilian population in the territory they occupied and interfered with the delivery of essential services including education. The DRC dragged its neighbours to the African Commission in the case of D.R. Congo v Burundi, Rwanda and Uganda(6). She complained, inter alia, that the incursion and occupation of her territory by the invading forces had denied the population its right to education. The African Commission held that these indiscriminate actions were in breach of the people’s right to education. To sum up, the right to education is a legal right whose enforcement is in the province of Courts. Yet for Courts to intervene the denial of the right to education must be indiscriminate, unjustified and unreasonable. Courts also consider issues of public policy and interests. It is my informed opinion therefore, that the right to education is not absolute. 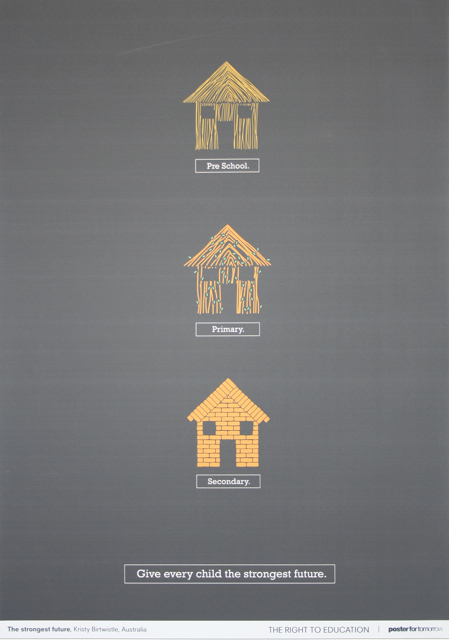 The 100 Posters Exhibition projected the view that the right to education is absolute and illimitable. This is not entirely accurate. 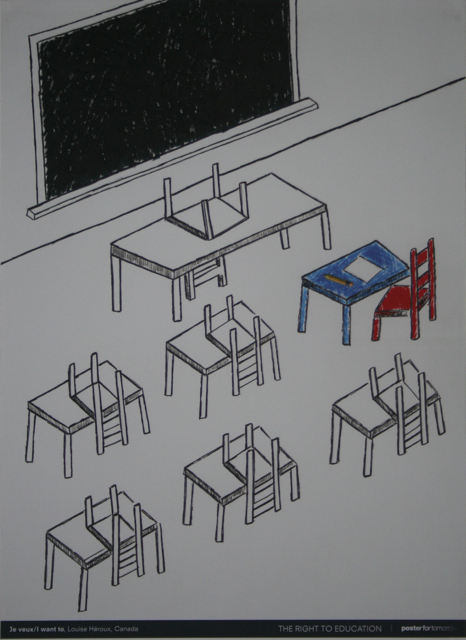 As such the exhibition does not succeed in enforcing the right to education. This does not mean that the exhibition, and the subsequent addition of the posters to the Institute’s permanent collection, was an exercise in futility. On the contrary it had three lessons which must be picked up. 1. It motivates artists and designers to look beyond mere commentaries on breaches of fundamental rights. Where rights are threatened artists/designers must use their art/design for activism. 2. Many of the posters on display, and the very fact that they were exhibits in a gallery, became objects of contemplation. They however advance a very important warning that ‘until we have universal education, our world will simply be wrong’. We can only ignore this warning at our peril. 3. That a human rights lawyer accepted to officially open the exhibition as guest of honour means that there is a shared goal between artists, designers and the legal fraternity in Uganda. They must jointly define, and meaningfully fight for, all fundamental rights and freedoms. Dr. Angelo Kakande has researched extensively on contemporary Ugandan art and the connection to politics. He is currently the Head of the Department of Design at MTSIFA. The 1995 Constitution of the Republic of Uganda. The African Charter on Human and People’s Rights. Association pour la sauvegarde de la paix au Burundi v Tanzania, Kenya, Uganda, Rwanda, Zaire and Zambia. Communication no.157/96 Available at http://www.achpr.org/english/Decison_Communication/Zambia/Comm.157-96.pdf (visited 17-1-2012). D.R. Congo v Burundi, Rwanda and Uganda. Communication no.227/99. Available online at http://www.achpr.org/english/Decison_Communication/Uganda/Comm.227-99.pdf (visited at 17-1-2012). Dimanche Sharon and Others v Makerere University. Constitutional Appeal No. 2 of 2004  UGSC 10 (1 August 2006) Available online at http://www.ulii.org//cgi-bin/uganda_disp.pl?file=ug/cases/UGSC/2006/10.html&query=dimanche (visited 17-1-2012). R v. Big M. Drug Mart Ltd (1985) 18 DLR 321. World Organisation Against Torture, Lawyers’ Committee for Human Rights, Jehovah Witnesses, Inter-African Union for Human Rights v Zaire. 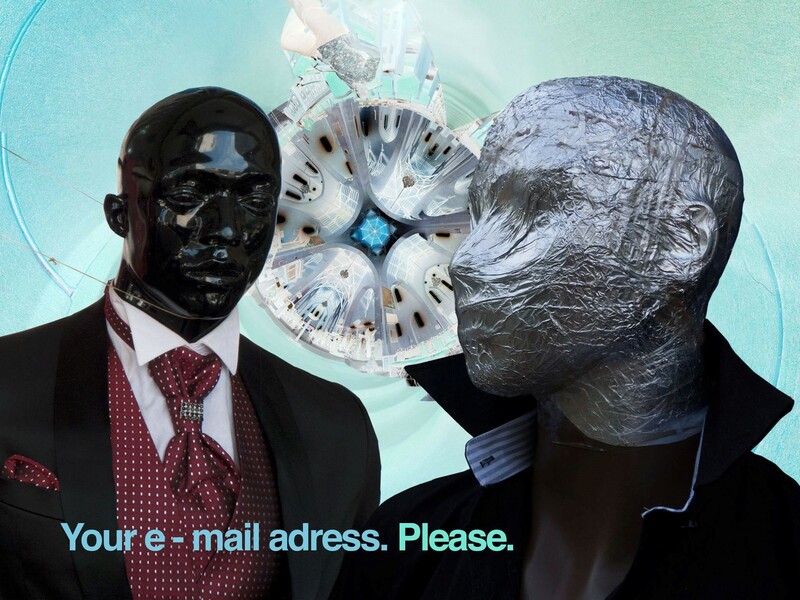 Communication no. 25/89, 47/90, 56/91, 100/93 Available online at http://www.achpr.org/english/Decison_Communication/DRC/Comm.%2025-89,47-90,56-91,100-93.pdf. (visited 17-1-2012). Poster for Tomorrow. 2011. Right to Education. Exhibition Catalogue.